Musical artist will.i.am addresses a crowd of students at NASA's Jet Propulsion Laboratory in Pasadena, Calif., where his new single, "Reach for the Stars," was beamed down from the Curiosity Mars rover and broadcast to the live audience on Aug. 28, 2012. The first song ever played from Mars was broadcast today (Aug. 28) from NASA's Curiosity rover on the Red Planet. The concert represented the world premiere of the appropriately named song "Reach for the Stars," by rapper and songwriter will.i.am. It was beamed via radio signal about 150 million miles (241 million km) back to Earth from Curiosity's landing spot on Mars' Gale Crater at 1 p.m. PDT (4 p.m. EDT). Mission controllers at NASA's Jet Propulsion Laboratory in Pasadena, CA, listen and clap along to will.i.am's new song that was beamed from Mars back to Earth, August 28, 2012. "The point of the song is to remind people … that anything is possible if you discipline yourself and dedicate yourself and stand for something," the musician said today from Curiosity's mission control center at NASA's Jet Propulsion Laboratory (JPL) in Pasadena, Calif. The music arrived there during an educational event held for students from the Los Angeles neighborhood where will.i.am grew up. "There's no words to explain how amazing this is," will.i.am. said. "These kids here are from Boyle Heights, the same neighborhood I'm from. We don't have to just end up in the 'hood. But it's a hard thing. The hardest thing is discipline." Students and rocket scientists alike bobbed their heads and clapped as the song's strains came back to Earth. Let's reach for the stars"
Musician Will.i.am, center, listens to NASA scientist Jim Garvin of the Goddard Space Flight Center talk next to a mock up of the Mars Science Laboratory rover Curiosity as astronaut Leland Melvin looks on at the Jet Propulsion Laboratory (JPL) a few hours ahead of the planned landing of the Curiosity rover on Mars, Sunday, Aug. 5, 2012 in Pasadena, Calif.
Also onhand at the event was former NASA astronaut Leland Melvin, now the agency's associate administrator for education. "Never give up," Melvin said. "People told me that I couldn't be an astronaut. Whatever you want to be, whatever you dream, you can do, if you put your mind to it." The $2.5 billion Curiosity landed on Mars Aug. 5 (PDT) after launching in November of last year. 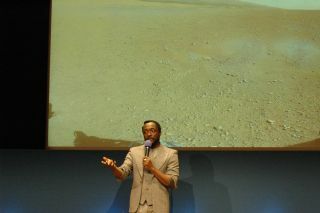 The song was loaded onto the rover before its departure from Earth, and will.i.am, part of the hip-hop group The Black-Eyed Peas, was at JPL in person to watch Curiosity land. The car-size rover is embarking on a two-year mission to search for signs that the Red Planet may have ever been habitable to microbial life.